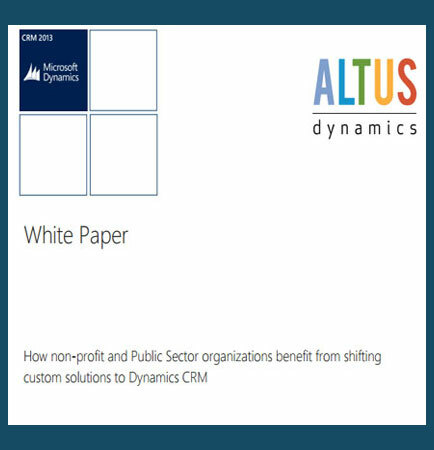 "Dynamics CRM for Non-Profit and Public Sector Organizations"
Today, customizing solutions is becoming less and less of a need than ever before. Standardized technology platforms from successful Enterprise Resource Planning (ERP) solutions have more capabilities than ever to handle most of your financial, human resources and payroll needs. When an ERP solution could not handle unique requirements organizations would need to turn to custom programmers who would leverage ACCESS databases, SQL databases, or even Oracle databases to gain unique functionality that organization could not live without. Dynamics CRM, a platform as well as a solution, provides non-profits and public sector organizations tremendous capabilities to leverage and address unique requirements never before accomplished without significant customizations. This whitepaper provides an overview of why Microsoft Dynamics CRM can be considered your next development environment when addressing unique requirements not covered in ERP.